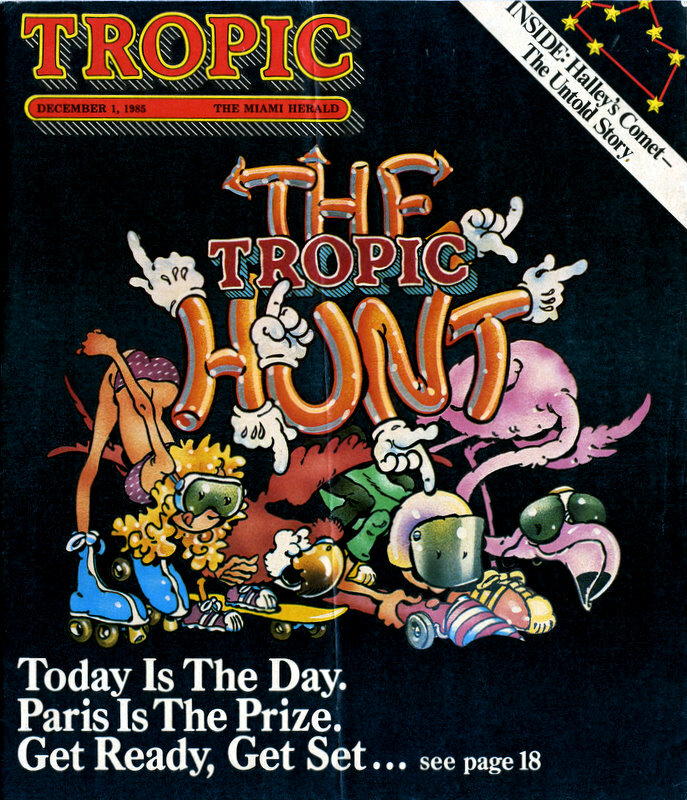 Your online guide to the zaniness of the 1985 Tropic Hunt! The second Hunt had the same situation as the first: race across three counties, gather your initial clues, put them together, get the final clue, etc. \nWith the success of the first Hunt, this sequel had to somehow top the first one. So this one brought things to a larger scale�literally! I mean, a Hunt site where the actual Goodyear blimp was a clue! And giant dice on a beach! And a HUGE game of Simon Says�and, also, my first brush with greatness, Dave Barry. 1. Zoologists tell us that the fastest animal in the world is, with a top speed of 100 feet per second, is a cow that has been dropped from a helicopter. Traveling at top speed, how many seconds will it take the cow to travel 1600 feet? 2. One day the U.S. House Special Select Committee on Leaving the Country decides to travel to Bermuda to find how come you never hear about any mine disaster there. If there are 10 members ot the committee, and each member has an entourage consisting of two key aides and one key research associate with nice bazombas, how many people total, will go on the fact-finding trip? 3. Find the deodorant advertisement in this magazine. Take the number of the page that it is on, and add to that its price, in dollars, for Tropic readers. 4. Three missionaries and three cannibals are trying to cross a river, but they have only one boat, and they can never have a situation where one cannibal is alone with two missionaries, because the missionaries keep demonstrating the "missionary" position, and the cannibals are sick of it. Assuming the boat has 20 horsepower, how many horsepower does the boat have? 5. One day the nine members of the U.S Supreme Court decide to fill their ears with Tic Tac breath mints. If each ear holds three mints, what is the court's total Tic Tac capacity? 6. Help Ned the Hunter get home to his mom before he is eaten by the giant mutant ducks (see cartoon, page 25.) How many baby rabbits will Ned step on before he gets home? You arrived to find a man on stage, leading the audience in a spirited game of Simon Says. He urged you all to compete. Maybe you were bashful, or lazy, and didn't join in. That was a bad decision, because if you stood to the side and watched, you had little chance of getting the clue. To solve this one, you had to play. Every few minutes, Mr. Simon Says (his name is Marty Goldstein and he is a frequent entertainer in the condo circuit) would order the participants to face the rear. At that moment, and only for an instant, he would press a button that would light up the number 25 on the far wall of the gym. You had to be facing the rear to see it. Twenty-five was your answer. You arrived to find two enormous Styrofoam dice sitting on the beach. You were handed a small die of your own. And you may have noticed Bugs Bunny walking around on the beach. You had to realize that there is only one way to read dice: by counting the dots on the top. But the dice were 12 feet high, so that was impossible. The only way to figure out what was on top was to rotate the little die in your hand until it matched the position of the big dice on the beach. If you did, you realized the sides facing up ("What's up, Doc?") were a six and a four. The answer was 10. You arrived at the Goodyear Blimp Base in Pompano Beach to see a strange scene. The blimp was right there, on the ground, not 30 feet from where you stood. Beneath the blimp were four football players (courtesy of Fort Lauderdale's Stranahan High School) dressed in Miami Dolphins jerseys. And you were handed a "Dolphin Diary" -- a stat sheet of Dolphin season records and leading scorers. The clue was a multiple choice, the numbers on the players' jerseys: 66, 69, 72 and 76. Which was the answer? Photo - The GoodYear Blimp. The largest Hunt prop ever. They gave you a hint, but you may have missed it. It was only printed in 15- foot-high letters, right above your head. If you checked your diary, you would have seen that only one of the four years on the jerseys -- '72 -- was a "good year" for the Dolphins; it was their best year, in fact, their perfect season. The rest were losing seasons. Also, the tune playing in the background was an instrumental version of It Was a Very Good Year. Just a little hint. This was the duplicated site, found at Spanish River High School in Boca Raton and Miami-Dade South soccer field. You had to go to one or the other, but not both. When you arrived, you entered past a replica of Halley's comet, and you found before you a most peculiar scene: a field with eight giant yellow stars placed in what seemed to be a random pattern. Plus a billboard with drawings of four animals on it -- a scorpion, a swan, a fish and a goat. On each animal was a number. You had to choose one of the four numbers, but which? Photo - You see how big these stars are? To solve this one, you had to remember that in Tropic was story about Halley's comet with an illustration. The illustration showed the constellations near which the comet will be visible in the next few months. They wanted you to turn to the page. Four of the constellations were Pisces the fish, Cygnus the swan, Scorpio the scorpion and Capricorn the goat. You had to figure out which constellation was laid out for you in the field. It wasn't easy: The lines between the stars were missing. And the field was very, very big. How was your spatial perception? The answer was the constellation Cygnus, and the corresponding number, 84. "Take a ride on the Metrorail," was all we told you. "Start anywhere." When you arrived at the Metrorail station of your choice, you were handed a free pass -- courtesy of Metrorail -- and a special ticket. "The answer to this clue isn't very hard," the ticket said, "all you have to do is add two numbers on this card." Sounded easy -- except the card had six numbers on it. Which two did you have to add? Some of you dutifully took the card and returned to your car to try to puzzle it out. Too bad for you. We told you to take a ride on the Metrorail and that's what we meant. You had to get on the train. On every car, we had "conductors" who punched your ticket. Once. They punched one of the six numbers. But you needed two numbers. When you asked them to punch it again, they refused. Some of you walked to the next car, to see if they were punching different numbers there. No such luck. Here's what you had to figure out: You had to get off the car and take a train going in the opposite direction. Our conductors going in the opposite direction punched a different number. The two numbers -- 31 and 22 -- formed the answer, 53. 10. They are in the penultimate paragraph. 25. If words were days of the year, this one would be Feb. 4. 53. One flower can become Nero Wolfe. 72. If words were letters of the alphabet, this one would be J. 84. If pages were months, this one would be December. And then rowed home in eight. What did you have to do? Let's take them one at a time. If pages were months, this one would be December. That meant Page 12. On Page 12 was the editor's column, by Tropic Editor Gene Weingarten. They are in the penultimate paragraph. Did you need a dictionary? "Penultimate" doesn't meant last -- it means next to last. We were directing you to the next to the last paragraph in the editor's column. If words were days of the year, this one would be Feb. 4. Feb. 4 is the 35th day of the year. We were directing you to the 35th word in the paragraph. When you counted, you found the word was "shellshock." If words were letters of the alphabet, this one would be J. Following the same reasoning, that meant we were directing you to the 10th word in the paragraph. The 10th word was "more." So you had "more" and "shellshock." What did you have to do with them? The last clue told you: One flower can become Nero Wolfe. What you had to recognize was that "one flower" was an anagram for "Nero Wolfe"; that is, they are composed of the same letters. Maybe some of you recognized the name Nero Wolfe, a famous sleuth of detective fiction. If you did, you got an additional hint. Because if you took the words "more" and "shellshock" and made an anagram from them, you wound up with the name of another fictional detective, the most famous of all. And that was the answer to the first part of The Tropic Hunt. Now you waited until 6 p.m. for the final clue to be delivered on the radio. You had to figure out who was speaking? Who is "I"? That's what you learned from Part One of The Hunt. Sherlock Holmes. So where is "my friend's Tropic isle"? Sherlock's most famous friend is Watson. We were directing you to Watson Island. But we had promised you didn't have to go anywhere to solve the last part of The Hunt. We were directing you to Watson Island on the map in yesterday's Tropic. ". . . I flew nine miles. . . ." If you looked on Watson island, there was a Chalk's seaplane facing southwest. We wanted you to travel nine "miles" in that direction. But there was no legend, no scale of miles on the map. How could you gauge the distance? Perhaps you noticed a figure in the lower right corner of the map, where the legend usually is. It was Miss Universe, being measured by a seamstress. She was exactly 1.4 inches high. "Remember, as the legend goes, a miss is as good as a mile. . . ." There was our "miss." You had to figure out that her height was one "mile" on the map. "We flew nine miles, jogged ten miles more. . . . "
Following the plane for nine Miss Universe lengths, you came to Metrozoo, where there was a jogging ostrich, heading north-northeast. Follow the ostrich's path for 10 "miles" and you came to Hialeah racetrack.
" . . . and then rowed home in eight." Because this message was delivered on the radio, many of you heard "rowed" as "rode." And so you followed the horse at Hialeah for eight "miles" until you came to . . . nothing. A sign that said "No way." We were throwing you a curve ball. You had to retrace your steps and look back at Hialeah. Near the horse, much smaller, was a man in a rowboat, heading down the Miami River. If you traced his path, you arrived at Stiltsville ("home"). So where was the winning phone number? ". . . the answer is the route I took . . ."
Every stop on the way -- the starting point, Metrozoo, Hialeah, Stiltsville -- was also a numbered Hunt site on the map. If you took all the numbers in order -- 97, 6, 69, 95 -- you had a phone number. 976-6995. Maybe you called it. You found out it was out of service. ". . . Don't forget, dial at the magic discount rate." Now you had to have a good memory. One of the original six riddles of The Hunt -- those easy, silly questions -- refered you to a funny ad in the magazine for "Armpit Magic" deodorant. At the bottom, in small type, it said that Tropic readers got a "special discount rate" of one-third off. What you had to do was take the phone number you had and subtract one third of it from itself. What you were left with was the phone number 651-1330. And that was the secret phone number for The Hunt. ". . . Call and ask for me. . . ."
If you called and asked for Sherlock Holmes, the final password, you were a winner. Jim Jacobsen, Jed Jacobsen, Jody Jacobsen, Josh Jacobsen, Matthew Taylor, and Jon Jacobsen, Jeff Jacobsen and Justin Jacobsen. Fred and Barbara Stone, Chuck Stone and Elizabeth Allen. CLICK HERE TO BROWSE PHOTOS FOR 1985!